Rollercoaster Tycoon 3D has been one of those 3DS releases that has been on-again and off-again enough times to be reminiscent of a tedious long-running sitcom relationship. In February it was revealed by Atari that it was on hold, while a March update from developer n-Space stated that it would arrive in late Spring. 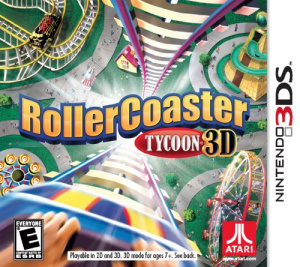 The developer and publisher seemed to be taking the rollercoaster idea from the game and into the development process, confusing gamers at the same time. Well, hold onto your safety harnesses, because more release promises are inbound. Website gamingbolt.com has claimed that the title is set to be released on 16th October, while namcobandaigames.eu is giving a date of 26th October. Perhaps these are regional North American and European release dates, or perhaps they'll once again turn out to be wrong; it's all part of the thrills and spills of following this title. If the game does arrive it may be fun to play, with a first-person view for rollercoaster rides, StreetPass sharing and the ability to invite Mii Plaza pals into your theme park. There's even a new teaser below promising a 2012 release, so maybe it will actually arrive as expected. I'm a roller coaster nerd and I've been waiting a long time for this game. I just really hope the delays mean they are actually creating a quality game. If not, I'll be highly disappointed. Can't wait to build Mr. Bones' Wild Ride in 3D!! @TheToader Agreed. I have been wanting to play a new RCT for some time (especially since I never got to play the third one as my computer could hardly run the demo). I really hope they make this game worth my money as I would love to revisit this franchise. lol the game is finished for 3-5months now? or what was it? I really want this game and though the only review (NP) didn't give it a stellar score, I have been a fan of the series for God-knows how long and I loved those first 2 games and I haven't played them in years. This will NOT be worth it. Nintendo Power got a review copy back in may and they gave it a 5.0 out of 10. Oh man, the original RCT was (and still is) an amazing game. I spent a lot of time playing it back in the day! It'll be interesting to see how well this turns out, as I wouldn't have thought the 3DS to be the easiest system to release it on. I hope it turns out well, though, so people who may have missed it originally get a chance to play! Man, I was hoping for some gameplay shots.... Regardless of the NP score, I'm hoping this turns out well. Would get it for a budget price. $19.99, yes? "The developer and publisher seemed to be taking the rollercoaster idea from the game and into the development process, confusing gamers at the same time." Finally!! I was afraid it was axed. My BF would only buy a 3DS if this game were to be released. So it's finally wallet-raiding time~ score. RCT really is something amazing. Building perfect parks is really addictive though. @LittleIrves I wish you luck on this budget price. Maybe 2 or 3 months after its release you will get that 19.99 price. it was supposed to be out in MAY!!!!! I'd rather go to a real rollercoaster place. I want this game! I used to love the thrillville series & this one is just like it! Even though this will likely have much less customization options than the PC versions, I'm really looking forward to how cool the 3D effect is while riding the rollercoasters. I might get this game based solely on that. I really hope they release a demo of this. @Xilef That was before the game got delayed.